The “Lunatic Fringe” has finally revealed what made him turn on his partner Seth Rollins a few weeks ago on Raw. After defeating Dolph Ziggler and Drew McIntyre in a tag-team championship match on the October 22nd episode of Raw, Ambrose turned on his partner Rollins, which was a big surprise move. It was the same night when Roman Reigns revealed that he has been fighting from leukemia. Ambrose again attacked Rollins last week after he lost the tag team titles to The Authors of Pain in a handicap match. On this week’s episode of Raw, Seth Rollins was looking for answers about the betrayal from his Shield brother, and it was finally revealed in a weird promo. 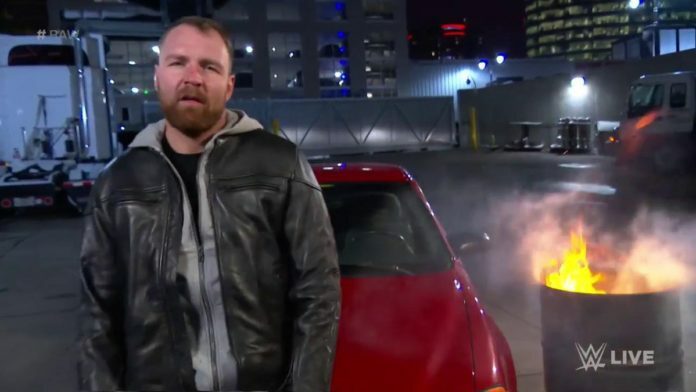 Ambrose, sitting on a car next to a lit barrel, explained that he attacked Rollins because he believed that Rollins and Reigns made him weak because he had to watch their backs. He used to believe that the Shield vest made him strong, but he doesn’t think so anymore. Saying that, he poured gasoline over the vest and threw it onto a burning barrel.